between this [pharmaceutical] industry and the mob. The mob makes obscene amounts of money, as does this industry. and the side effects are the same in this industry. and so does the drug industry …"
If you believe pharmaceutical corporations hold the health of the general public in high regard, it's time to reconsider. The industry is filled with examples of wrongful death, extortion, fraud, corruption, obstruction of justice, embezzlement, fake journals, harassment and hit lists that would make even the most hardened Mafia godfather blush. Big Pharma has been fined billions by the U.S. Department of Justice, but these enormous fines don't curb the corruption, it's just looked upon as "the cost of doing business," similar to paying the utilities. 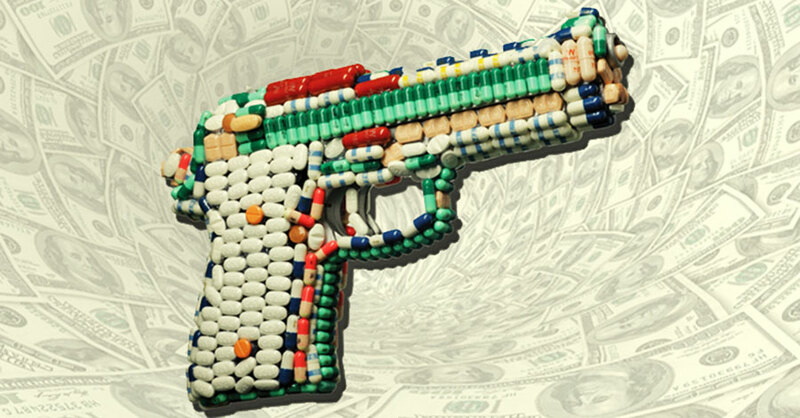 As a physician and researcher, Peter C. Gøtzsche has firsthand experience with the criminality behind the pharmaceutical industry - and subsequently exposed the massive fraud in "Deadly Medicines and Organized Crime - How Big Pharma has Corrupted Healthcare." Professor Peter C. Gøtzsche graduated as a Master of Science in biology and chemistry in 1974 and as a physician 1984. He is a specialist in internal medicine; worked with clinical trials and regulatory affairs in the drug industry 1975-1983, and at hospitals in Copenhagen 1984-95. With about 80 others, he helped start The Cochrane Collaboration in 1993 with the founder, Sir Iain Chalmers, and established The Nordic Cochrane Centre the same year. He became professor of Clinical Research Design and Analysis in 2010 at the University of Copenhagen. Peter has published more than 70 papers in "the big five" (BMJ, Lancet, JAMA, Ann Intern Med and N Engl J Med) and his scientific works have been cited over 15,000 times. A large part of Dr. Gøtzsche's academic career has focused on bias, trials and evidence synthesis. In "Deadly Medicines and Organized Crime," Gøtzsche reveals the corruption behind exorbitant prices for branded drugs, bringing attention to the fact that drugs are not expensive because of development costs, but because of the political lobbying, marketing and excess profit taking. He also points out many trials are nothing more than smoke and mirrors, where pharmaceutical companies organize research in such a way that the best populations and comparison groups are selected for the very reason that they support the preferred outcome of the company; they control data and do analyses in-house and hire professional writers to write the papers. The pharmaceutical companies then cherry pick the results to suit their marketing needs, instead of what's in the best interest of patients. Many times, academics are paid to be listed as contributors to the study, yet in reality, they had very little input and cannot substantiate the data. "The 'best' drugs may simply be those with the most shamelessly biased data." Around half of those who die have taken their drugs correctly; the other half die because of errors, such as too high a dose or use of a drug despite contraindications. Our drug agencies are not particularly helpful, as they rely on fake fixes, which are a long list of warnings, precautions, and contraindications for each drug, although they know that no doctor can possibly master all of these. Major reasons for the many drug deaths are impotent drug regulation, widespread crime that includes corruption of the scientific evidence about drugs and bribery of doctors, and lies in drug marketing, which is as harmful as tobacco marketing and, therefore, should be banned. Before you shrug-off Gøtzsche's argument as simply one man's view on a complex issue, consider pharmaceutical giant Merck's tainted history. During testimony in an Australian class action case, emails between Merck employees presented labels such as "neutralize," "neutralized," or "discredit" next to doctors' names who criticized the drug Vioxx. "We may need to seek them out and destroy them where they live…"
"Even worse were allegations of Merck damage control by intimidation," he wrote. "This has happened to at least eight (clinical) investigators… I suppose I was mildly threatened myself but I never have spoken or written on these issues." Jump to 2001 and the company was still engaging in unethical tactics. Produced a fake 'peer reviewed' journal under the name of "Australasian Journal of Bone and Joint Medicine" for the sole purpose of marketing pro-Vioxx articles. Published an entirely ghostwritten journal article and had a doctor sign his name to it, even though a Merck employee felt the data presented was "wishful thinking." With this three-ring circus of corruption projected to become worse in the future, the American Medical Association (AMA) has - right on cue - brought forward new guidelines which will essentially place a gag order on any physicians who do not tow the party line, including those who speak out against pharmaceuticals. "There's a great deal of dissent among medical professionals when it comes to natural health, and many refuse to entertain the idea that healing involves more than pharmaceutical chemicals. 'create ethical guidelines for physicians in the media, write a report on how doctors may be disciplined for violating medical ethics through their press involvement, and release a public statement denouncing the dissemination of dubious medical information through the radio, TV, newspapers, or/and websites'," said Dr. Edward Group, founder of the Global Healing Center. Incredibly, the AMA represents only 17% of medical doctors, many of which are medical students who were given a free membership. And yet, the organization is the fifth most powerful special interest group on Capitol Hill, paying out a staggering $19.7 million for lobbying efforts in 2014 alone. Read more about the silencing of medical dissenters - and how to take action - here. Richard Smith: "Is the pharmaceutical industry like the mafia?"